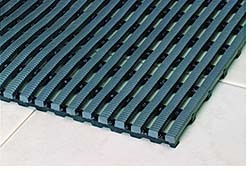 Heronrib provides slip resistance on pool decks. Features open grid construction and channeled underbars to drain water, while the 3/8-inch height keeps the top-walking surface relatively dry. Additives impede growth of bacteria and fungi. The matting can be rolled up for cleaning and is produced in rolls up to 40 feet and in widths of 2, 3 and 4 feet.